After an underwhelming and disappointing performance at home to Fulbeck last week, Revesby CC had the chance to put that behind them with an opening away league fixture at the picturesque setting of Owmby. And they did just that, recording an 81-run victory in the Lincoln and District League Division One. Losing the toss, Revesby were put into bat on a greenish but dry wicket. Openers R. Knight and L. Odlin got the visitors off to a solid start taking before Knight was caught behind for a patient and determined 18. Shortly after, Odlin passed 50 for the first time this season with Revesby, which was well deserved following a range of aggressive shots that helped to increase the scoring rate. 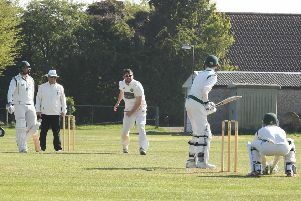 In between his fine knock, Revesby lost captain R. Jeffery and wicket keeper M. Twells, both without scoring in just three balls, which threatened to put a halt to the encouraging start. Odlin was the fourth wicket to fall as he was finally out for a valiant 63 when the score was on 98. The middle order of G. Lane and J. Lewis set about increasing the tempo and put on a further 56 runs for the fifth wicket, before Lewis was out for a quickfire 19. M. Ridding joined G. Lane and ended the innings on 19 not out, providing good support to the excellent batting of Lane, who finished on 58 not out, following a range of powerful cuts and drives. The 41 runs they added took the final score to a competitive 195-5 from their 40 overs. In reply, Owmby lost a quick wicket in only the second over, with J. Lewis bowling Z. Bowring for a duck, with the score on five. D. Hill and W. Cawte then added a further 38 runs for the second wicket before Cawte was well caught in the gully by L. Steadman off the bowling of S. May for 18. The run rate continued to increase and further wickets were taken by D. Hunt, L. Steadman, R. Knight and M. Ridding as the home side eventually finished their innings on 114-7. Owmby’s captain D. Hill held their innings together and was the top scorer with 62 hard earned runs. Ridding finished with 2-13 from four overs, with all the other wickets being shared out. This was a solid performance by Revesby which saw them gain maximum points that will hopefully help to kick-start the season. On Sunday, Revesby take a short break from league action as they entertain Freiston in a friendly over the Bank Holiday weekend.